Air conditioning. Our best friend and our worst enemy. 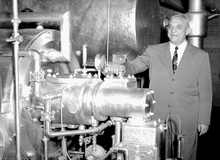 The year was 1902, a 25-year-old New York engineer named Willis Carrier invented modern air conditioning and our lives have never been the same since. Did you know that the term Summer Blockbuster is actually a result of air conditioning being introduced to the public over the Memorial Day weekend in 1925? 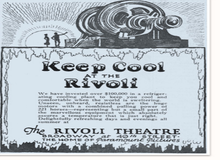 That's when air conditioning made is public debut at the Rivoli Theater in Times Square. People filed into air-conditioned movie theaters on hot summer days giving rise to the term summer blockbuster. Ever since it's invention, we've had a love-hate relationship with Air Conditioning. We love it when it works, but man, oh man, do we hate it when it breaks down! Air Conditioing repair or replacement is not fun. Regular service and maintenance of your air condition can help to extend the life of your air conditioner. We are confident we can provide all of your air conditioning service needs. Whether you need repairs, installation or service, we've got your covered. For more information on our residential or commercial air conditioning services, please contact us at 352-600-4443. We will gladly discuss your current air conditioning needs, and schedule a time for one of our professional technicians to provide you with a free estimate. Or, if you'd like, you can also fill out the easy, no-obligation form on this page and one of our professional, yet friendly staff members will be in touch immediately with more information on our services. We don’t just repair air conditioners; we create comfortable homes. When you call Spring Hill Air Conditioning, our comfort specialist will listen to your family’s needs to find a cooling system that best fits your family and your budget. ​​Spring Hill Air Conditioning professionals will install your new unit and show you how to use your programmable thermostat. Your new thermostat will keep your cooling system running at its optimal efficiency level. We will haul away your old AC unit and thoroughly clean all work areas. Proper disposal of your old compressor and other AC system parts is part of our exceptional service. We install only high quality equipment from Carrier, Trane and Lennox. We use only the best to suppliers ensure many years of reliability and comfort. But best of all, you can rest assured knowing that we stand behind every air conditioner we install, guaranteed. ​Last but probably most importantly we show you how to operate and maintain your new air conditioning system. We will also explain the maintenance required to keep your system in top running condition and under warranty. If you’re building a new home or replacing your old system with a new, more efficient air conditioning system for your current home, Spring Hill Air Conditioning offers systems that have the capacity, efficiency and price that will fit your budget perfectly. Our systems include cooling, heating, comfort controls and accessories. Our technicians will assist you in selecting the perfect system for your home. We will gather detailed information to deliver maximum cooling at a minimum energy cost. Spring Hill Air Conditioning will take the steps necessary to ensure the installation process is quick yet as efficient as possible. We can typically complete the process in one day. Once the installation is complete, we thoroughly inspect your new system to make sure everything is running efficiently and to your satisfaction. You can rest assured that we go to every length to make sure we leave no trace of our presence in your home – except cool air. Spring Hill Air Conditioning is a full-service commercial HVAC company located in Spring Hill, Florida. No matter what your cooling needs are from design-build to top notch installation, maintenance, or repair, Spring Hill Air Conditioning offers a variety of commercial HVAC services for businesses and commercial buildings of all sizes. We are confident we can provide all of your air conditioning service needs. Whether you need are searching for home ac service near me, ac repair companies near me, ac repairs Spring Hill, FL, ac maintenance or a new ac installation, we've got your covered. If you have been searching for ac repair company near me, you are in the right spot. For more information on our air conditioning services, please contact us at 352-600-4443, or fill out our convenient contact form. We will gladly discuss your current air conditioning needs, and schedule a time for one of our professional technicians to provide you with a free estimate. ​We’re nearing the start of summer and our air conditioning units will soon be working overtime in Spring Hill, Florida. Inevitably, something may go wrong when you try to start your ac unit after the winter months. Possible Causes: If you can’t get your air conditioning system to start at all, then you may have a blown circuit breaker or fuse, an improperly set or faulty thermostat, or possibly an internal switch has been turned off. 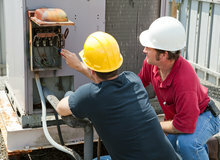 Make sure the air conditioning unit is receiving power from the electrical panel. Reset the circuit breaker or replace the fuse. Check the ac units condensation overflow tray for excessive water. Some air conditioners have a sensor on the tray that turns the ac unit off when it senses water. Ensure that all switches in and around the air conditioner are set to the “on” position.Check the external safety switch which is usually near the condensing unit. Is the blower door on the air handler is securely closed? Possible Causes: If you can hear the air conditioner running but it isn't cooling, this could be a result of blocked airflow — filters, registers or compressors. Low freon levels could also be the problem. Without the right amount of refrigerant, heat & humidity cannot effectively be removed from the air. Check the thermostat. Does it need new batteries? Is it set correctly? Look at the condenser to see if it’s dirty or blocked. If it's dirty, clean the condenser and be sure to completely remove the blockage. Condensers can easily become blocked by weeds, grass, or other debris. Has ice has formed on the coils? Check the outdoor compressor? Is it dirty? If so, clean it. Your compressor could be faulty or your may be low on freon which would require a air conditioning professional to repair. Possible Causes: A blockage in your ductwork, or the ductwork has become disconneted. A dirty air filter could be causing the issue as well. Replace or clean the air filter if it's dirty. Look at all ductwork to make sure its not disconnected. You'll need to check all ductwork including the ductwork in your attic or crawl spaces. Reconnect as needed. Are your register dampers set to an open position? If you have a basic understanding of the different parts of your air conditioning system, cleaning your air conditioner is something you can do yourself. If the problem persists, and you need professional ac service, we are just a phone call away. Proper air conditioning maintenance is the best was to avoid issues and prevent problems in the future. Give Spring Hill Air Conditioning a call at 352-600-4443 if you have any questions. We’re always happy to help! 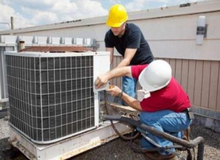 Looking for air conditioning repair in Brooksville, FL? We are always happy to help our Brooksville neighbors with their air conditioner repair in Brooksville, FL. Why is my air conditioner blowing warm air? You definitely shouldn’t be feeling warm air coming from your vents, it obviously means somethings not working right, but you didn't need an ac expert to tell you that! You can fix the first 2 common ac problems yourself, the rest however, will require the help of an air conditioning professional. 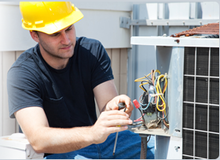 Prefer to have a professional diagnose and repair your AC issue? Our team of Spring Hill Air Conditioning experts can handle any repair, including the issues listed above. Call us today! ​​Is it Time to Replace My Air Conditioner? One of the toughest things you'll have to decide on is, When is it time for a new air Conditioner? Even though a new air conditioner can be a big investment, the costs of continuing to run and repair an inefficient, old ac unit can add up quickly. How will you know when it’s time to replace your air conditioner? There are six common signs listed below to help you make a tough decision a little easier. 1. Is your Air conditioner over 10 years old? You can typically expect a well-maintained air conditioner to last between 10 - 15 years. if you’re starting to need expensive repairs and your air conditioner is over 10 years old, often times it makes more sense to replace your ac. One of the main reasons is the advancements in efficiency in air conditioners in over the last decade. 2. If your air conditioner has a low SEER rating, it is considered inefficient by today's standards. Your older air conditioner can be costing you a lot of money to operate it. Newly manufactured air conditioners are required to have a SEER rating of at least 13. If your air conditioning units SEER rating is below 13, your energy costs will be greatly reduced by replacing your old ac with a newer more energy efficient air conditioner. 3. Expensive ac repairs. Whenever you’re facing expensive repairs, you’ll want to compare the cost of the repair against the cost of a new ac unit. In our experience, it makes better financial sense to replace your ac if the cost of the repair would cover a large portion of the cost of a new air conditioning system. Especially if your air conditioner has been showing other signs on our list. 4. Is your ac breaking down frequently? Are you calling for repair service every month because of a new problem with your ac unit? Repair costs can add up really quickly. Save yourself the trouble by investing in a new ac unit. 5. Does your current air conditioner use R 22 Freon? Did you know that the federal government is phasing out the use of Freon?It is being phased out in order to conserve energy nationwide. The result is that the cost of Freon is steadily rising. If your current air conditioner requires Freon, it will eventually have to be replaced. If you’re already experiencing major problems with your current air conditioner it’s may be the right time to replace your air conditioning unit. 6. You can get or keep your homes temperature comfortable. You may have the wrong size air conditioning system for your home. Or it may be the sign of an aging air conditioner. If your air conditioner is not keeping your house cool, or your electric bill is out of control, it may be time for a new air conditioner. If you have any questions about replacing your air conditioner, or if you’d like an estimate on a new air conditioner for your home, call us at Spring Hill Air Conditioning. We're your local air conditioner installation and repair company in Spring Hill, Florida! Check us out across the web!